Spaceport NewsJohn F. Kennedy Space CenterAmerica's gateway to the universe. Leading the world in preparing and launching missions to Earth and beyond. August 29, 1997 Vol. 36, No. 17Mission Update Mission Update Shuttle-Mir STS-87 SRB retrieval ships to begin towing external tank(See SHIPS, Page 8) The two ships which have been retrieving spent solid rocket boosters (SRBs) for the Space Shuttle program since its inception in 1981 now have an additional job: Delivering the Shuttle external tank that is manufactured in Michoud, La., to KSC. While the first tow is still a ways away around the April/May 1998 timeframe the hardware needed to do the job is already on deck at NASA's Hangar AF on Cape Canaveral Air Station, home port for the two ships. The initiative fits in well with both NASA Administrator Daniel Goldin's better, cheaper, faster philosophy as well as the streamlining measures Shuttle prime contractor United Space Alliance (USA) is tasked with implementing. In the past, the task of towing the external tank by barge to KSC was carried out under a subcontract overseen by Marshall Space Flight Center. USA is now managing that subcontract, which will be phased out once the SRB ships take over. The ships' primary task will continue to be the retrieval of the spent SRBs following a Shuttle launch, said Anker Rasmussen, USA chief technical manager for postflight LIBERTY STAR Capt. Joe Chaput examines one of two massive Texas bars on dock at Hangar AF. The bar weighs about 6,800 pounds and will be secured to the stern of the retrieval ship for towing the Shuttle external tank. Busy week at Americas spaceportONE Shuttle rolled out to the launch pad Aug. 18 and another returned to KSC the following day. The Space Shuttle Atlantis (above) is now at Pad 39A, undergoing final preparations for launch Sept. 25 on the seventh Shuttle-Mir docking mission, STS-86. The Terminal Countdown Demonstration Test is scheduled for Sept. 910. At about 7:08 a.m., Aug. 19, Discovery (right) touched down on Runway 33 of KSC's Shuttle Landing Facility, bringing Mission STS-85 to a successful conclusion. Researchers were delighted with the performance of the primary scientific instruments flown on the 86th Shuttle flight, the Cryogenic Infrared Spectrometers and Telescopes for the Atmosphere (CRISTA)-SPAS and the Middle Atmosphere High Resolution Spectrograph Investigation (MAHRSI), both of which performed flawlessly. Internal EVA conducted: Mir 24 cosmonauts Anatoly Solovyev and Pavel Vinogradov and U.S. astronaut Michael Foale continue the process of verifying restoration of electrical power to the Russian Space Station Mir after an intravehicular activity Aug. 22. Troubleshooting of the oxygengenerating system also was under way, and an extravehicular activity was tentatively set for the first week of September to conduct an inspection of leak sites on the damaged Spektr module.STS-86 Atlantis (20th flight OV-104) 87th Shuttle flight Pad 39A 7th Mir Docking Launch: Sept. 25, 10:34 p.m. Crew: Wetherbee; Bloomfield; Parazynski; Titov; Chretien (France); Lawrence; Wolf. Commander Wetherbee flew on STS-63, the Shuttle flight that rendezvoused with Mir in 1995 to set the stage for the first docking. Russian Vladimir Titov also was on board that flight. Columbia (24th flight OV-102) 88th Shuttle flight Pad 39B Launch date: Nov. 19, 2:18 p.m. USMP-4; Spartan 201-04 Crew: Kregel; Lindsey; Scott; Chawla; Doi (Japan); Kadenyuk (Ukraine) Spartan 201 is a solar physics spacecraft. This fourth flight in a series is being coordinated with the ongoing Solar and Heliospheric Observatory (SOHO) mission. Page 2 SPACEPORT NEWS August 29, 1997 HONORED in August were (from left): Fran Carter, Engineering Development; Pauline Shook, Installation Operations; Nicole Fromberg, Chief Financial Officer's Office; Bridgett Mack, Safety and Mission Assurance; Kathleen Ellis, Administration Office; Shawn Quinn, Checkout and Launch Control System; Barbara McCoy, Center Director's Office; Kim Boatwright, Space Station Hardware Integration Office; and Sybil Largent, Procurement Office. Not shown are James Joyner, Payload Processing; Art Maples, Biomedical Operations; Marty Pontecorvo, Logistics Operations; and Arnold Postell, Shuttle Processing.And the winners are . Frances Walsh (Electronic Engineering) and three guests will attend a Marlins spring training game as winner of the Combined Federal Campaign slogan contest. The slogan for this years campaign: Combined for Caring Felix Soto Toro (Engineering Development), winner of the CFC drawing, will be taking three guests to the Manatees game on Aug. 30, United Way Night at Space Coast Stadium in Viera. Both winners will be recognized at the 1997 CFC KickoffEmployees of the month CFC slogan contest winners announcedCancer screening begins in SeptemberScreening for colorectal cancer will be offered free to all KSC employees in the month of September. The screening is done using the hemoccult (guaiac) slide process. Kits containing the hemoccult slides, special directions for correct use, a questionnaire and general information will be available on the following schedule: Industrial Area, Occupational Health Facility, 7 a.m. 5 p.m., Mon.-Fri.; Launch Complex 39 area, Launch Area Clinic, 24 hours a day, seven days a week; Cape Canaveral Air Station, Cape Area Clinic, 7:30 a.m. 4 p.m., Mon.-Fri. Ceremony, Oct. 1, in the Training Auditorium by keynote speaker Ken Lehner. Formerly with the New York Yankees baseball organization, Lehner is General Manager of the Manatees and director of Brevard Operations for the Florida Marlins. He was awarded a presidential honor in 1992 for work in the inner cities with underprivileged children by giving them an opportunity to play youth baseball. The 10th annual coastal cleanup, sponsored by the Center for Marine Conservation and Keep Brevard Beautiful, will be held Saturday, Sept. 20, from 9 11Volunteers needed for beach cleanupScience fiction writer awards to be held at KSC Visitor ComplexScience fiction fans will have the chance to meet current and future star writers of the genre at the 13th annual L. Ron Hubbard Achievement Awards, being held this year at KSC's Visitor Complex on Saturday, Sept. 27. The Writers of the Future Contest was established in 1983 by L. Ron Hubbard to discover and assist beginningBrevard symphony plans KSC concertThe Brevard Symphony Orchestra begins its 1997-98 season with a space-themed pops concert, Liftoff '97, at the Apollo/Saturn V Center, Saturday, Sept. 20. Buses will depart beginning at 6 p.m. from the KSC Visitor Complex. The concert begins at 8 a.m. Volunteers may register at any one of 10 sites along Brevard's east coast. Call Keep Brevard Beautiful, 639-0666, for more information. writers of science fiction and fantasy. In the past 13 years, some 200 novels and more than 1,500 short stories have been sold by contest winners in the field of speculative fiction and other genres. Contact Bev Widder, Dateline Communications, in Venice, Calif., for more information, tel. 310 5812680. p.m. after a reception and features musical director and principal conductor Christopher Confessore. Guest soloist Andy Taylor makes an encore appearance. Ticket prices are $50 per person, which includes a light buffet. Call the BSO, 2422024, for more information. Unsuspecting preyTWO Great White Herons seem unware of the threat posed by an alligator lurking nearby. Bionetics photographer George Shelton saw at least 17 alligators prowling the waters of Banana Creek when he took this photo Aug.12. Page 3 SPACEPORT NEWS August 29, 1997 For KSC locksmith Bill Nichols of EG&G, unusual assignments go with the territory, but the job he was called on to do at Launch Pad 39A recently ranks as one of the most unusual. It seemed that during closeout of the pyrotechnic cans on the STS-94 Shuttle stack, a piece of Teflon had become lodged in the liquid hydrogen pyro can helium vent tube. The Teflon is used to prevent closeout material from entering the purge tube cavity. During removal, the end of the Teflon had broken off and was stuck. After repeated efforts to remove the Teflon failed, aExamples of good deeds are plentiful at KSCEditor's Note: The following three stories brought to the attention of Spaceport News by coworkers involve employees from across the spectrum of the KSC work force and show that heroism, oldfashioned ingenuity and simple courtesy are displayed freqently here at the space center.Locksmiths skills saves processing time Security shows its softer sideDealing with the unusual is something the EG&G Florida security force must be prepared for at all times, and the events of May 29 illustrate why. Officers Jerry Deese and Brian Kanipe, Sgt. Thomas O'Connor and Lt. Steve Bufford went beyond the call of duty to help a lost elderly man find his way home. The gentleman arrived at Gate 4 midafternoon, miles from his destination a dentist's office in Fort Lauderdale. Security personnel had to make numerous phone calls to try and locate next-of-kin, contacting everyone from the dentist's office to the condominium complex where the elderly man lived alone. It was not until after midnight that a relative finally arrived to take the man home. In the meantime, he was taken to Security Patrol Headquarters, fed a warm meal and watched over by solicitous personnel. United Space Alliance employees Jerry Bowman and Daryl Elder will tell you that they didnt think twice about the chances they took to save NASA Quality employee James Swansons life the day of April 16, but in retrospect their bravery is breathtaking. The two men were on their way home after working out in the KSC gym, when they were horrified to see the car in front of them plunge off the road into a canal off the NASA Causeway heading west. Inside, they could see a man moving around on the driver's side. Realizing the driver was unable to help himself, Elder and Bowman rushed over to the vehicle, already waistdeep in water. There was no phone nearby, and they soon discovered that all the windows and doors on the car were locked. Attempts to kick in a window were to no avail. As Elder and Bowman continued their rescue attempt, a driver pulled up and used her cellular phone to call for additional help. Then, in a day where one miracle seemed to follow another, another passerby pulled over who just happened to have a three-pound sledgehammer in his vehicle. With a window now busted open, Bowman and Elder tried to extricate the stricken driver from the car. We later learned he was in diabetic shock, Elder said. He was clutching the steering wheel and it was almost impossible to get him to let go. The car slipped farther, the driver's head now barely above the rising water. We finally got him out and pulled him up on the bank, only to realize there was an alligator just aMan's life saved in a miracle-filled day LOCKSMITH Bill Nichols wields a pick similar to the one he used at the pad to remove a piece of Teflon from flight hardware. few feet away, Elder said. A security guard arrived on the scene and stood between the two rescuers and the gator, and medical help arrived to care for the driver. Asked what motivated them to work so hard despite the danger to save a stranger's life, and Bowman and Elder's response is simple: You don't really think about it, you just do it, Bowman said. suggestion was made to have the KSC locksmith try to remove the debris and Nichols was contacted. After a rehearsal using a mockup of thepyro can, he went to work. It was not an easy job. Wielding his locksmith pick, Nichols had to extract a piece of Teflon a mere eighth of an inch in diameter and less than half an inch in length, lodged inside a tube of about the same width and three to four inches in length. It took a good 30 minutes of perseverance and patience, but Nichols got the Teflon out. His skill saved nine and a half shifts to remove and reinstall the pyro can plus another two shifts that would have been needed to erect an enclosure to accomplish the task. In a letter of commendation thanking Nichols for his resourcefulness and skill, Process Integration Director Larry Ellis observed, Your efforts prove that it truly takes everyone at Kennedy Space Center to process and launch a Space Shuttle.USA employees Daryl Elder (standing left in photo at right) and Jerry Bowman placed their own lives at risk to save a stranger from drowning. EG&G FLORIDA security personnel (left) went out of their way to help a lost elderly man get back home. From left are Lt. Steve Bufford, Sgt. Thomas O'Connor, and Officers Brian Kanipe and Jerry Deese, the four security officials most closely involved with the incident. August 29, 1997 SPACEPORT NEWS Page 4 NASAs Mars Pathfinder spacecraft a novel mission to send an inexpensive lander and roving prospector to the surface of Mars has concluded its primary mission, fulfilling all of its objectives and returning a wealth of new information about the red planet. The robotic lander, which continues to explore an ancient outflow channel in Mars northern hemisphere, completed its milestone 30-day mission Aug. 3, capturing far more data on the atmosphere, weather and geology of Mars than scientists expected. In all, Pathfinder returned 1.2 gigabits (1.2 billion bits) of data and 9,669 tantalizing pictures of the Martian landscape.Commitment to low-cost planetary exploration pays offThe data returned by the Sagan Memorial Station and Sojourner has been nothing short of spectacular, and it will help provide a scientific basis for future Mars missions, including a sample return, for years to come, said Dr. Wesley Huntress, NASA associate administrator for space science. The Pathfinder teams can do attitude not only was critical to overcoming several complex technical challenges during development and cruise, but has carried through the uncharted territory of operating a solar-powered lander and mobile rover on the surface of a planet millions of miles from Earth. This mission demonstrated a reliable and low-cost system for placing science payloads on the surface of Mars, saidMars pathfinder concludes primary science missionBrian Muirhead, Mars Pathfinder project manager at NASAs Jet Propulsion Laboratory. Weve validated NASAs commitment to low-cost planetary exploration, shown the usefulness of sending microrovers to explore Mars, and obtained significant science data to help understand the structure and meteorology of the Martian atmosphere and to understand the composition of the Martian rocks and soil.New portrait of Mars emergesA new portrait of the Martian environment has begun to emerge in the 30 days since Pathfinder and its small, 23-pound rover began to record weather patterns, atmospheric opacity and the chemical composition of rocks washed down into the Ares Vallis flood plain. The rovers alpha proton X-ray spectrometer, led by Principal Investigator Dr. Rudolph Rieder, was responsible for making the first in-situ measurements of rocks near the landing site. We are seeing much more differentiation of volcanics than we expected to see, said Dr. Matthew Golombek, Mars Pathfinder project scientist at JPL. The high silica content of one of the rocks weve measured suggests that there was more crustal activity heating and recycling of materials early in Mars history than we thought. Similarly, atmospheric-surface interactions, measured by a meteorology package onboard the lander, are confirming some conditions observed by the Viking landers 21 years ago, while raising questions about other aspects of the planets global system of transporting volatiles such as water vapor, clouds and dust, said Science Team Leader Dr. Timothy Schofield. The meteorology mast on the lander has observed a rapid drop-off in temperatures just a few feet above the surface, and one detailed 24-hour measurement set revealed temperature fluctuations of 30-40 degrees Fahrenheit in a matter of minutes. In addition, sweeping, color panoramas of the Martian landscape, created by the Imager for Mars Pathfinder (IMP) team and Principal Investigator Peter Smith, are revealing clear evidence that the surface of Mars has been altered by winds and flowing water.Rover surpasses all expectationsThe rovers performance has easily surpassed its designers minimum expectations. Engineers designed the roving vehicles electronics, battery power and hazard avoidance features to see it through at least a week of safe roving, not knowing beforehand what conditions it might encounter on Mars. After 30 days, the rover is still healthy and has clocked 171 feet in travel distance, circumnavigated the lander and taken 384 spectacular views of rocks and the lander. Sojourners capabilities to detect hazards and then act on its own to overcome those hazards has been remarkable, said Dr. Jacob Matijevic, Sojourner project manager. The technology experiments we have been able to perform with the rovers wheels have given us more information about the composition of the Martian soil, as well as rocks around the landing site. Sojourners durability in this frigid, hostile environment is also showing us that we are on the right track to building smarter, even more durable rovers for future missions. Pathfinders primary objective was to demonstrate a low-cost way of delivering an instrumented lander and free-ranging rover to the surface of the red planet. Landers and rovers of the future will share the heritage of spacecraft designs and technologies tested in this pathfinding mission.IN this image, the Sojourner rover is perched atop the Mermaid Dune, a dark material distinct from the surrounding bright surface. Dark red tracks extend from the foreground to the base of the rover's wheels. THE rover's right front camera took this image of the Pathfinder lander. The large rock at right, nicknamed Squash, exhibits a diversity of textures. It looks very similar to conglomerate, a type of rock found on Earth that forms from sedimentary processes. 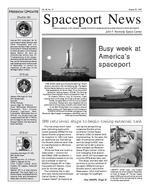 SPACEPORT NEWS Page 5 August 29, 1997EG&G Alabama, Inc., a division of EG&G, Inc., of Cocoa, Fla., has been awarded a contract by Marshall Space Flight Center, Huntsville, to provide center operations support services for a period of up to five years, beginning Sept. 1, 1997. If all options are exercised, the contract could be worth approximately $77.8 million. This amount does not include work that could be called for under a provision that may be used to procure additional services on an indefinitedelivery, indefinite-quantity basis. Services to be provided include operations, mainte-EG&G snares Marshall BOCnance, renovations, modifications, construction and environmental support services at the center. The fixed-price, performance-based contract will be divided into a one-year base period and four one-year options that may be exercised at NASAs discretion. The services to be provided essentially are a continuation of the effort currently being performed under the base maintenance mission services contract by BAMSI of Titusville. Excluded, however, are a few specific types of services which have been absorbed under other contracts.NASA selects ISO 9001 registrarThe Mars Pathfinder Sojourner, a lightweight machine on wheels, is accomplishing a revolutionary feat on the surface of Mars. For the first time, a thinking robot, equipped with sophisticated laser eyes and automated programming, is thinking and reacting to unplanned events on the surface of another planet. After a few days on the Martian surface, when we left the rock named Yogi, we turned on Sojourners hazard avoidance system and asked it to start making some of its own decisions, said Brian Wilcox, supervisor of the robotic vehicles group at JPL. This hazard avoidance system sets the rover apart from all other machines that have explored space. Sojourner had to make that trip to the next rock without the benefit of detailed information to warn it of obstacles along the way. Sojourners hazard avoidance system is comprised of five laser stripes that project out to the ground. These lasers cut across anything in the rovers path, Wilcox said. By looking at the shape of the stripe with the rovers cameras, we can detect rocks and build contour maps of the terrain immediately inSojourner rover is a thinking robotfront of the rover. To complement its laser eyes, the rover has three levels of autonomy to use in choosing its path across the Martian sand, with the highest risk level allowing the rover to climb over rocks almost as big as the wheels. Sojourners intelligence is based on a mathematical model that emulates animal behavior. The ability for animals to avoid or flee danger, such as predators, is a low level reflex, Wilcox explained, but it gets the job done. Previous spacecraft have operated solely using sequences of instructions created by human operators on the ground, along with preprogrammed safing sequences which protect the spacecraft from harm and reestablish contact with Earth if some failure should occur. Sojourner has both of these capabilities, but also has reflexes to avoid hazards and respond to unplanned events. Whereas Sojourner can only plan 20 centimeters ahead, our next rover will be able to plan 10 meters or more ahead. And while Sojourner has no concept of what rocks look like 20 meters away, her successor will be able to recognize rocks that far away very easily, Wilcox said. SOJOURNER rover's hazard avoidance system is comprised of five laser stripes that project out to the ground. One laser is located in the center of the rover body and points straight ahead. Two of the beams are pointed outward at a modest angle from the center beam, while two more project much farther outward, like peripheral vision, beyond the rover's body. The rover is shown here undergoing preflight processing at KSC. The lasers are located on the opposite side of the vehicle.NASA has selected a thirdparty registrar, Det Norske Veritas Certification, Inc. (DNV, Inc.), Houston, to provide detailed compliance audits of KSC and other NASA centers. This selection is a milestone in moving closer toward NASAs goal of having the agency ISO 9001-certified by September 1999. NASA is the first federal agency to commit to ISO 9001 certification. Whats important to remember about this step in moving toward ISO compliance is that the registrar will be looking at one overall KSC system, not one in each directorate, says Laura Gosper, chief of the Business Innovation Group (BIG). Nonconformities should be welcomed as an opportunity to identify the root cause and implement improved practices. It will only make KSC stronger and therefore more efficient. ISO 9001 is an international standard for quality management systems that has been accepted by more than 100 countries. The standard suggests 20 basic elements as the essential building blocks for an effective management system. It also offers great flexibility in applying the 20 elements, thereby promoting streamlined, effective and innovative management processes. The system uses a third-party certification process to ensure that NASA meets international accreditation standards. Once KSCs longterm business system is approved and implemented, audits will become a way of life for us, Gosper adds, but it should be viewed as a positive experience. Auditors may ask employees about their work processes, the records they have, and the training theyve been given. During an audit, employees will have the opportunity to demonstrate our business systems performance in an objective manner. All NASA centers, except Johnson Space Center and Marshall Space Flight Center, are within the scope of the contract that will be managed by Lewis Research Center. August 29, 1997 SPACEPORT NEWS Page 6Summer students delight in learning more about U.S. space programMore than 120 students who participated in KSC-sponsored summer educational programs this year were able to gain a real-world work experience while providing valuable support for the space center. Some also got a chance to learn about Russian space life sciences programs directly from scientists from that country while working on KSC research in that field. I knew that working at KSC would be a different learning experience that you cant get anyplace else, said Florida A&M University sophomore Victor Laird. I have gotten a lot out of this experience that will help me in the future. Laird was among 35 students from six universities who completed a 10-week internship at KSC through the NASA Scholars program that is sponsored by the KSC Equal Opportunity Program Office. Each student is assigned to a NASA mentor. The objective of the program is to provide trained employees for the workforce in the United States.While all of the work the students performed in helping their mentors collect data, conduct experiments and develop new hardware and procedures was beneficial for the space program, some received special recognition for their efforts. Justice Harvey, a Boston University junior who is participating in the KSC Summer Aid program, was presented with a NASA Certificate of Recognition by the KSC Office of the Chief Counsel for outstanding legal research, documentation and community outreach support. I am really glad to be able to help out while I am here at KSC, Harvey said. I really want to go into law and it has been helpful to learn just what goes on behind the scenes in a court case. Nineteen other Summer Aid students helped out in several other NASA directorates during their eight-week program this summer, said program coordinator Theresa Page. This program provides high school and college students with professional work experience.This year, Page and Tracy Young of the KSC Public Affairs Education Services Branch coordinated the Summer High School Apprenticeship Research Program (SHARP). Twenty outstanding junior and senior high school students from five Central Florida counties were selected based on their interest and aptitude in science and engineering. This summer, they performed a wide variety of tasks with their mentors, including helping develop a simulation to test space flight hardware, collecting and analyzing field samples for environmental studies and conducting basic research on the growth of plants for the Advanced Life Support and Space Biology (ALSSB) program. Each student, who is classified as an engineering technician, must complete a technical or research project and present their results during the eight-week program. The NASA-wide SHARP program has been in operation at KSC since 1980.Another long-standing educational effort at KSC, the Space Life Sciences Training Program (SLSTP), brought college students, space center mentors and Russian scientists together this summer in Hangar L at Cape Canaveral Air Station.Among many other projects, the 41 SLSTP students were there to assist their NASA/KSC Space Life Sciences program mentors with experiments that are manifested to fly on the Space Shuttle in the near future. These investigations include the Closed Equilibrated Biology Aquatic System (CEBAS) and the Microgravity Plant Nutrient Experiment. The purpose of the SLSTP program is to attract students who are interested in research applicable to NASA efforts as advanced life support, space biology, flight and life science technology, and ecological programs. While at KSC, the students in the sixweek program are involved in the conceptualization, design and development of experiments dedicated to the human exploration of space and improving the quality of life on Earth through the application of space-based technology. The students insights into the Russian space program in the life sciences field came when they attended presentations by visiting scientists Alexander Mashinsky and Galena Netchitailo. The pair, who were here to conduct research with KSC Life Sciences personnel, filled the students in on the kind of life sciences research that has been conducted on the Mir space station, as well as on Soyuz and Salyut spacecraft.BOSTON University Junior Justice Harvey receives a plaque from Acting Chief Counsel Doug Hendriksen, for outstanding legal research, documentation and community outreach support. Henry said his KSC experience has led to interest in pursuing a law career. SLSTP students pose for a group photo in Hangar L with two visiting Russian scientists, Alexander Mashinsky (fifth from left) and Galena Netchitailo (center). These students were in the gravitational biology emphasis group and were part of a group of 41 students who participated in the SLSTP program, held at KSC each summer. The Russian scientists talked about Russian life sciences research. Behind the group is a high-fidelity mockup of the SVET greenhouse, the real one currently housed on the Mir space station where it is being used for plant research. August 29, 1997 SPACEPORT NEWSPage 7 UCF student Patricia Jones, who participated in the NASA Scholars Program, said the experience made her feel she had a part in shaping the nation's future in space.Students from Pittsburg State University in Kansas earned high marks for their help in upgrading a thermal vacuum chamber in the NASA Materials Science Physical Testing Laboratory. The students, Mike Martinie, Jarret Hudson, Paul Wright and Adam Crowder, worked alongside Randy Buchanan, an assistant professor from Pittsburg State who was participating in the NASA Faculty Summer Fellowship and the lead for the project. This chamber was completely inoperable before the Pittsburg State group began working on it, said Materials Science engineer Bill Dearing. The chamber is a critical test item for use on space flight hardware and having it down could have impacted launch schedules. Not only did the Pittsburg State team get the chamber back on line, but they improved its operation by devising, installing and activating a more modern and sophisticated controller system. They also saved NASA a considerable amount of money.Although the benefits of the summer student programs to KSC are obvious in terms of research conducted and money saved, the long-term rewards for the students and to NASA are harder to determine. However, past KSC surveys have shown that 87 percent of SHARP students have gone on to the study of higher levels of math and science in college, and feedback from students indicates that the programs are effective in stimulating the pursuit of a career in the sciences and with the space program. Its very important to become involved with the next goals for this country to go to Mars and the Moon and beyond, said Patricia Jones, a University of Central Florida chemistry major who spent the summer conducting plant growth research. It will really be fun to be a part of it. A partnership between Kennedy Space Center, the State of Florida and manufacturer L-3 Communications Telemetry & Instrumentation delivered a new system that enhances Shuttle launch preparations and promises commercial applications as well. On Aug. 22 at the KSC Visitor Complex, L-3 Communications presented the finished product to KSC Director Roy Bridges and other managers. The new Automated Data Acquisition System (ADAS) will save up to 20,000 man-hours per year while monitoring temperature, pressure and vibration measurements at KSCs Shuttle launch pads. Before ADAS, when test engineers needed to reset Shuttle sensors they also had to manually re-adjust hundreds of transducers. The new system reduces that effort from hours to seconds. Sharing NASA expertise while improving Shuttle safety is directly inline with KSCs goal to build productive partnerships with industry, said Dr. Gale Allen, chief of KSCs Technology Programs and Commercialization Office. Funded by NASA, the State of Floridas Technological Research and Development Authority (TRDA) and L-3, a development team comprised of NASA, I-NET and L-3 engineers pooled their expertise to achieve this technologicalNASA/industry team scores big with dual-use technology breakthrough. I-NET, KSCs Engineering Support Contractor, produced the systems key component the Universal Signal Conditioning Amplifier (USCA). USCA has a continuous calibration feature that allows it to recognize and automatically match itself to any type of transducer. Two Melbourne, Fla., companies and a St. Augustine firm hold L-3 contracts to fabricate ADAS hardware, and L-3 is currently marketing the system to potential aerospace, industrial and automotive customers. Our number one goal is creating and preserving jobs for Floridians, said Frank Kinney, TRDA executive director. We want to prove that you can transfer cutting-edge technology to other industries and grow more jobs in the process.I-NET employee Johnny Kerce installs a Universal Signal Conditioning Amplifier (USCA) in the field at the Launch Equipment Test Facility. The USCA is a key component of the new ADAS monitoring system that measures temperature, pressure and vibration at KSC's launch pads. The breakthrough technology is expected to reduce sensor setup and configuration times from hours to seconds. NASA Engineer Curtis Ihlefeld installs a circuit board in the Automated Data Acquisition System at the Launch Equipment Test Facility. Three organizations, including KSC, teamed up to develop ADAS. Page 8 SPACEPORT NEWS August 29, 1997 John F. Kennedy Space CenterSpaceport News The Spaceport News is an official publication of the Kennedy Space Center and is published on alternate Fridays by the Public Affairs Office in the interest of KSC civil service and contractor employees. Contributions are welcome and should be submitted two weeks before publication to the Media Services Branch, PA-MSB or sent via e-mail to the following SMTP: Paula.Shawa-1@kmail.ksc.nasa.gov Managing editor. . . . . . . . . . . . . . . . Bruce Buckingham Editor. . . . . . . . . . . . . . . . . . . . . . Paula Shawa Editorial support provided by Sherikon Space Systems Inc. Writers Group. Photographic support provided primarily by The Bionetics Corp. and Photographer George Shelton, also of Bionetics.USGPO: 532-112/20054Ships. .(Continued from Page 1) operations. Formerly with the Navy, Rasmussen's entire space program career has focused around the ships, Hangar AF and SRB retrieval activities. He's delighted to find a new use for the veteran vessels, which between the two of them have returned 168 spent SRB casings to port. Permanent structural changes already have been made by Dentyen's Shipyard, Charleston, S.C. These include strengthening of the stern at critical points, new bulwark fairings, and the installation of a new H-bitt through which cabling will be threaded to keep it centered during towing operations. Still to be installed is a new double winch, referred to as a double-drum waterfall winch, said Joe Chaput, captain of the Liberty Star retrieval ship. One drum will support booster retrievals while the other will be devoted to ET towing. It will be within the line of sight of the aft bridge of the ship, from where booster retrieval operations are controlled, thus offering better control capability than the current system. Other equipment will be taken on and off the ships depending on which job they are performing, including the Texas bar that provides maneuvering capability. Chaput and Freedom Star Capt. Dave Fraine are accompanying the current ET towing contractor on trips from the Michoud plant located on the Mississippi River Gulf Outlet, a 65-milelong channel, becoming familiar with the route and the towing operation. We have to complete at least four roundtrips to meet the pilot license requirements to tow the barge, said Chaput. Rasmussen said the changes and new hardware will pay for themselves after about 14 to 15 ET deliveries. The ships have a top cruising speed of about 17 miles (15 knots) per hour, and a range of 6,900 miles. They were built at Atlantic Marine Shipyard near Jacksonville in 1980-81. The same firm which designed them, Rodney E. Lay & Associates, assisted with the design work for the modifications to allow ET towing. FREEDOM STAR Capt. Dave Fraine secures a buoy to the new H-bitt. THE Texas bar undergoes a fit check on the stern of one of the 176-foot-long retrieval ships in June. Cabling originating on a new double-drum waterfall winch will pass over the H-bitt in the center of the photo and then over the Texas bar to the tank-carrying barge. The Texas bar provides maneuvering capability, allowing movement of the cable across the bar when the ship is rounding a bend or making a turn. Message in a bottleIN THE Payload Hazardous Servicing Facility, Cassini Science and Mission Design Manager (left) Charley Kohlhase and Cassini Program Manager Richard Spehalski hold the Digital Video Disk bearing 616,403 digitized signatures of citizens of the United States and 80 other countries.The disk, stored in a specially designed package, was later mounted to the side of the two-story spacecraft (behind the two men) beneath a pallet carrying cameras and other science instruments. DESIGNED by Kohlhase, the disk cover (left) shows the flags from 28 of the 81 nations represented on the disk. Saturn, its moon Titan and Earth also are featured as is Cassini and the Huygens probe. Also featured are feathers symbolizing the Golden Eagle; these were used as writng quills to spread wisdom.